When the torch passed through Jennings and Scott counties September 17, 38 torchbearers brought their personal and state histories to the route. Here are four of their stories. Raymond Jones of Scottsburg, IN, currently serves as the vice president of the Scott County council and is an EMS adviser who recently had the Raymond W. Jones Emergency Medical Services Complex named in his honor. “[I was] a little bit surprised, a little bit humbled … when you settle it all down, then I was very honored,” Jones said. Before the relay, Jones was apprehensive but excited. He received the torch from the mayor of Scottsburg and carried it in a 1934 fire truck. “I carried the torch through our veterans’ memorial on the courthouse lawn … of course I’m a vet and a retiree,” Jones said. “I can’t tell you what the emotions were, they were mixed … I was pleased to be able to do that.”. Miss Indiana USA Morgan Abel of North Vernon was one of 20 torchbearers for Jennings County. For her, Indiana means growth, change, future promises and most importantly, it means safety and security. Going into the relay, Abel felt nerves comparable to walking on stage to compete, but she was extremely excited and fortunate to be a part of history. Dan Wright is the mayor of Vernon, Indiana, one of only two Indiana towns with a mayor. In the past, only cities had mayors. He has served as Vernon’s mayor for 14 years but did not expect to be selected as a torchbearer. Vernon’s bicentennial was actually in 2015, because the town was established one year before Indiana became a state. Vernon’s current population is 323, and North Vernon has approximately 6,500 residents. A town ceremony and proclamation took place when the torch came to Vernon. The torch went through Vernon, up to North Vernon, and then travelled back by train to Vernon before moving to Jefferson County. For Wright, one of the most memorable moments for him was the way he carried the torch. He was asked to think of unique ways to carry the torch, so he chose to ride in a Crosley pickup truck that was built in 1948. The developer of the Crosley car formerly owned the Cincinnati Reds as well as property across the river from Vernon, which is now known as the Crosley Fish & Wildlife Area. Wright gave the torch to John Whitcomb of Indianapolis. 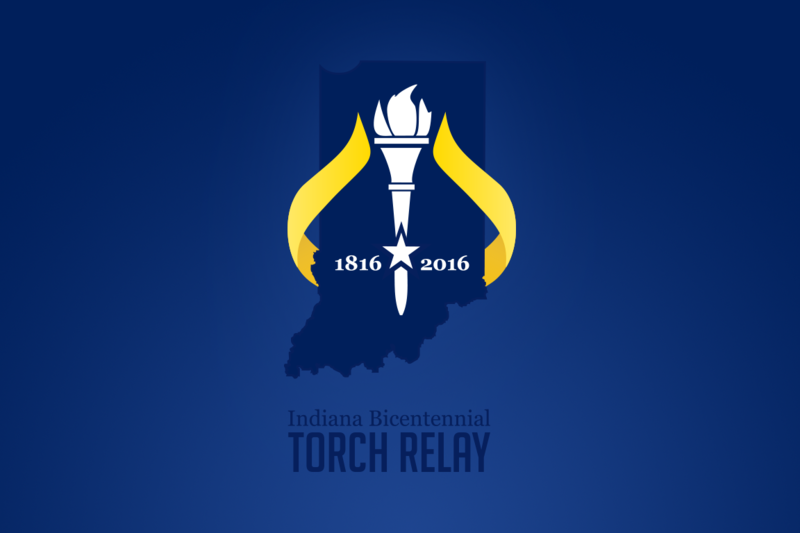 Whitcomb was chosen as a torchbearer in honor of his grandfather, Edgar Whitcomb, who served as governor of Indiana from 1969-1973. Edgar Whitcomb was supposed to carry the torch, but he passed away in February at age 98. When John Whitcomb was notified that he had been selected as a torchbearer, he was confused as to why the state would want him to do it. The state initially approached John’s mother with the position, but due to her busy schedule, John was selected. “Few will have the greatness to bend history itself; but each of us can work to change a small portion of events, and in the total; of all those acts will be written the history of this generation.” -Robert Kennedy Thank you to the four torchbearers who shared their stories and became part of history.